On Tuesday I slept in and then worked on the blog for Monday. I hobbled around all morning and afternoon as sleep didn’t do much for the knee. I think the jogging for a quarter mile to get my license plate may have something to do with it. Barry, who works for the Bengals, picked me up at 5:35 and we were parked 17 minutes later. We parked at Paul Brown Stadium and made the 10 minute walk to the ballpark. Barry had found a great deal on StubHub for one of the all-inclusive areas (minus alcohol). The tickets are usually $85 but he found them for $13; score! 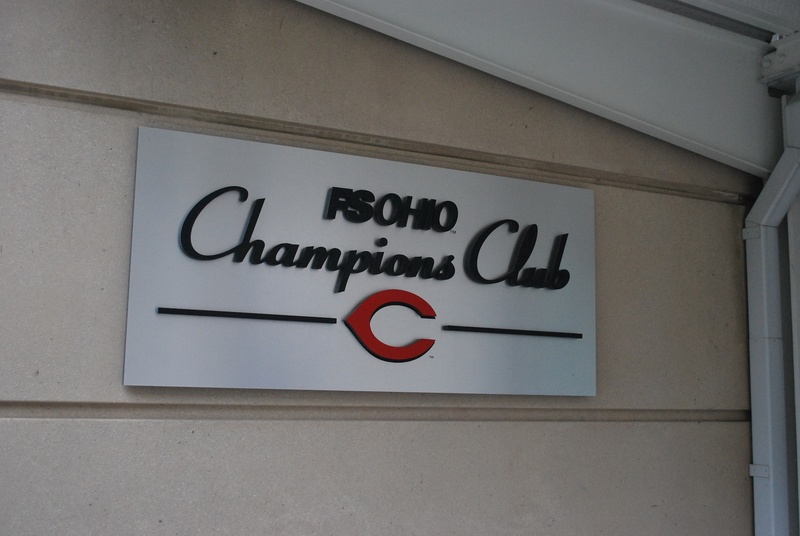 Here’s the sign on the field level concourse for the Champions Club (sponsored by FS Ohio). 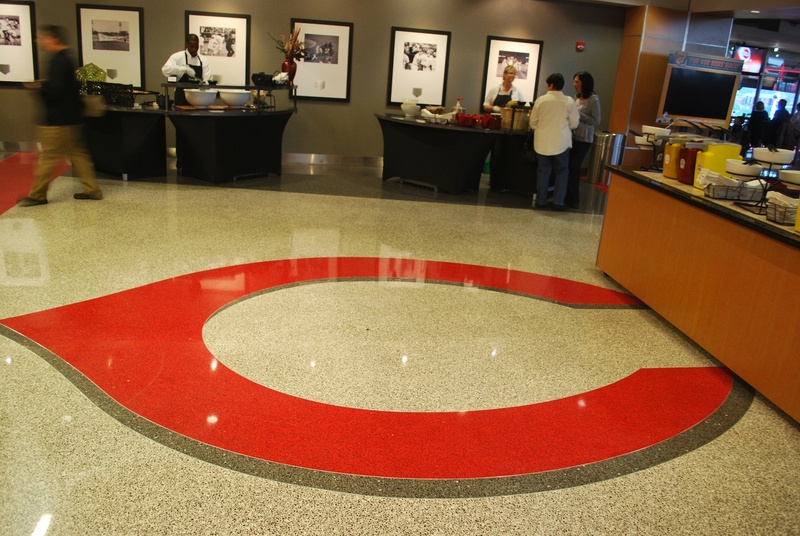 After taking the elevator to the club level and getting my wristband I came across a giant (Reds) C on the floor. 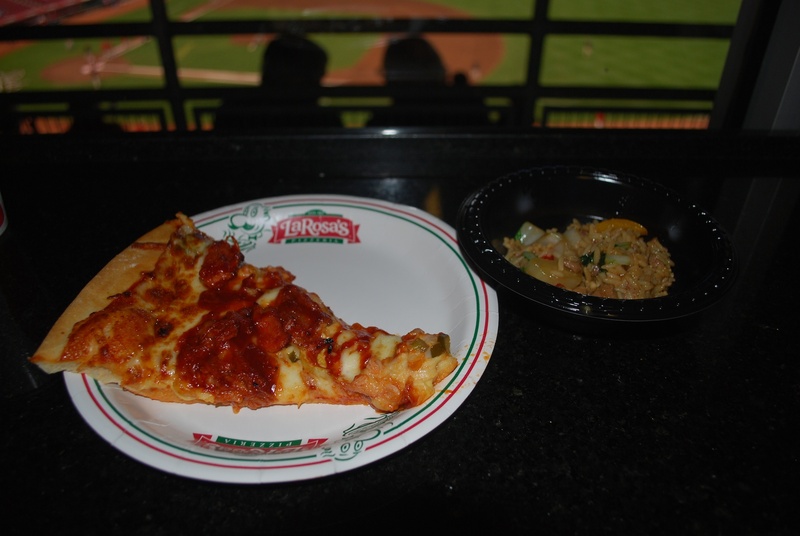 To the left they have hot dogs and typical ballpark food but the rest of the Champions Club has a bunch of other options. 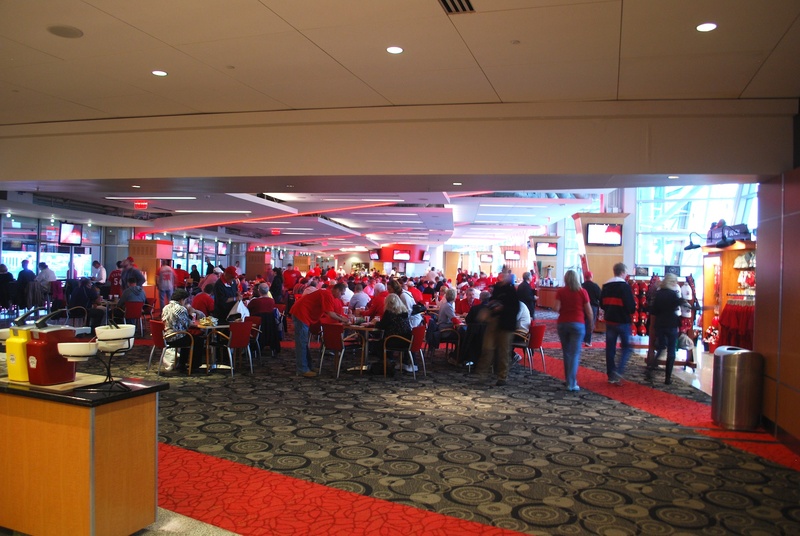 This is the seating area with the serving areas scattered along the outside. 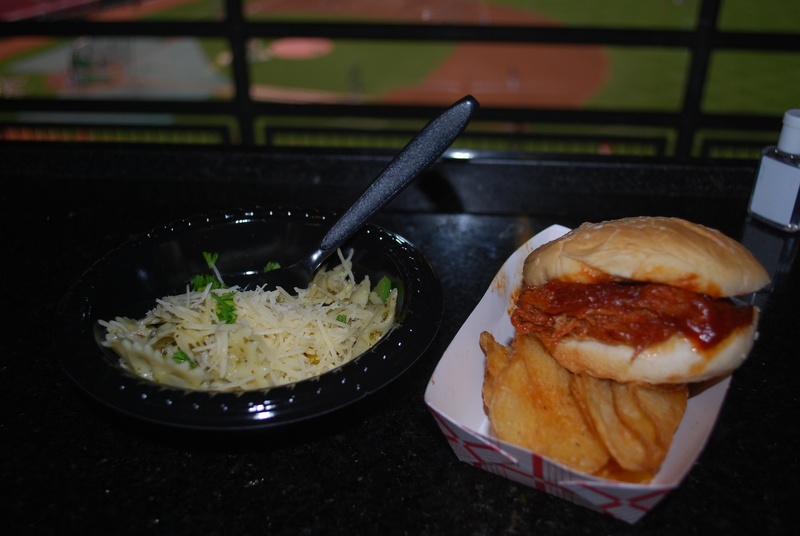 My first time up I had some shrimp pasta with pesto sauce and a BBQ pulled pork sandwich. Both were very good. My second time up I had a piece of pizza that I’m not 100% sure what was on it. I think it was bacon and hot peppers with barbecue sauce. I also had some beef fried rice. I think there was a little too much barbecue sauce on the pizza and a little too much oil in the rice dish. Overall I was satisfied with the offerings they had, and for $13 you can’t go wrong. After eating we went out to the seating area to get game photo number 154. Barry said that he was going to get it in one take this time and he delivered. Nice job Barry! The game started at 7:10 and Norichika Aoki took a ball from Reds starter Johnny Cueto. 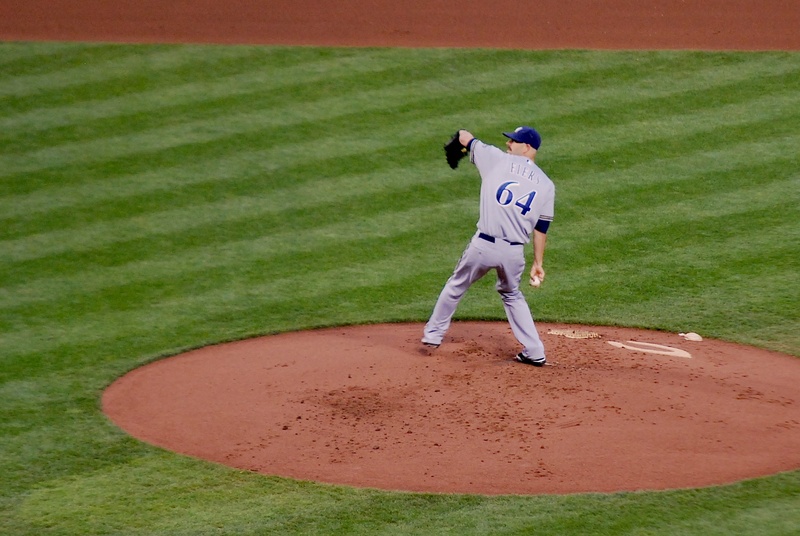 Fiers got the start for the Brewers and he’s been struggling a bit as of late. His first two and a half months he was suspiciously phenomenal so some regression was expected. Here he is about to throw the first pitch of the bottom of the 1st. He usually has a nice beard going but on Tuesday he went with the mustache and the mustache only. I’m guessing he was doing it to try and change his luck. Five of the first six batters in the bottom of the 2nd singled off Fiers and the Reds took a 2-0 lead. It could’ve been worse though and with one out Fiers induced an inning-ending double play. In the 5th the Brewers cut the deficit in half when Segura singled home Gomez. Segura tried going to third when the ball got past the catcher but was thrown out in the process. Schafer was set to pinch hit for Fiers and I would’ve liked to see him get a shot with Segura at second. The Reds came right back and scored two more runs in the bottom of the 5th. 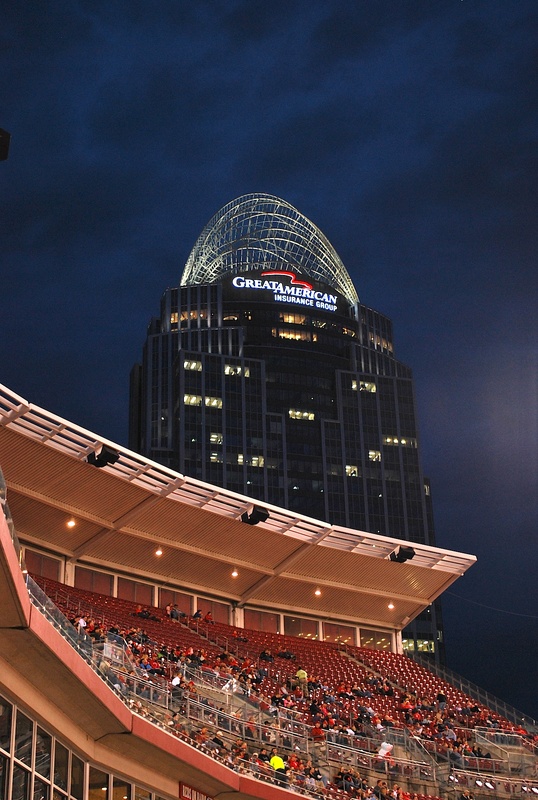 At some point I took a picture of the Great American Insurance Group building that sits across the street from GABP. I like the clouds and the dark blue sky behind the building. Aramis Ramirez hit a solo home run in the top of the 7th but that’s all the closer the Brewers got. Final score: Reds 4 – Brewers 2. It was a tough loss and with the Cardinals win over the Astros the playoffs are a long shot. 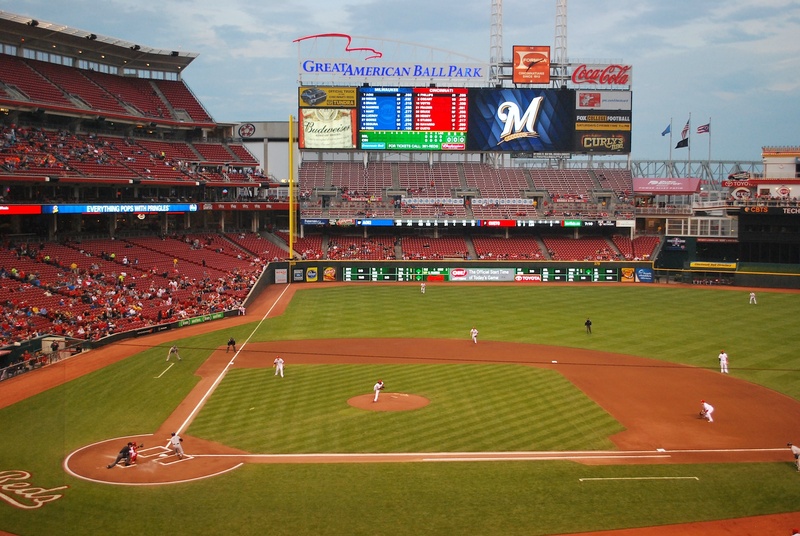 If the Brewers win their last 8 games the Cardinals would have to go 3-4, and that’s just to force a one game playoff in St. Louis for the second wild card spot. Not impossible but it’ll be extremely difficult and the Brewers will need some assistance as well. No matter what happens the recent surge (24 wins in 30 games) has made the final month and a half much more exciting. It’s past noon on Wednesday and I’m meeting Barry and his friend Will (a Reds fan) at 5:00 to have a few beers before game two of the series. I’m a little nervous that one of the next two games will get rained out. 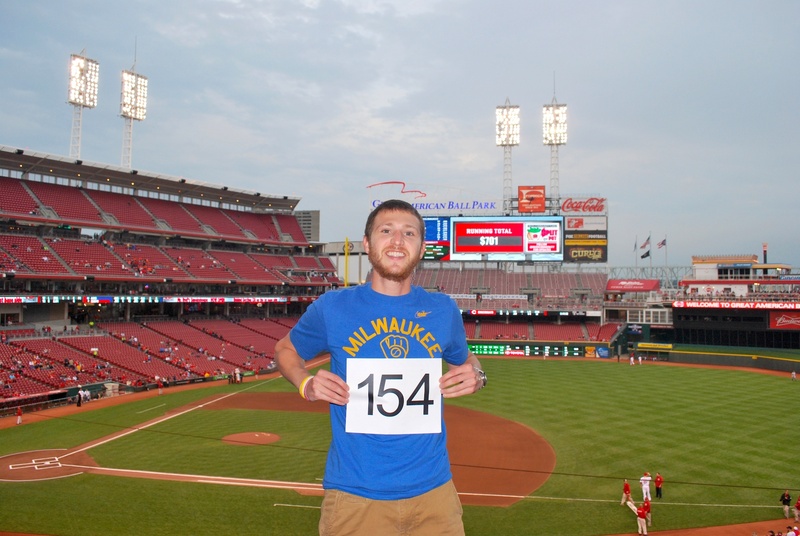 If that happens and the Reds (or Brewers) don’t need the game to be made up, then I’ll have to change this years journey to Mission 161. That doesn’t have the same ring to it.